Success in the digital future will depend on your company’s ability to implement a new cultural understanding that uses digital technology innovatively and rethinks strategy, as well as leadership. You better start to transform towards a digital culture NOW. Our comprehensive research in the field of Digital Culture says that 62% of respondents see corporate culture as one of the biggest hurdles in the journey to becoming a digital organization1. Additionally, findings show that there is a profound disconnect between leadership and employees on the existence of digital culture in their organization. But why is digital culture so important? A digital corporate culture is highly interlinked to economic success and employees’ job satisfaction2. The need for a change towards a digital culture is unquestionable. Yet, challenging questions remain: What exactly is a digital culture? And how to transform successfully? Front-runner or slow-mover? How digital is your culture? 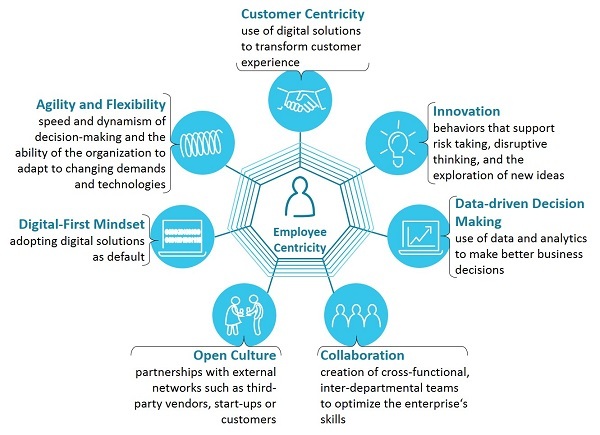 Our digital culture assessment measures the maturity of the seven dimensions of digital culture such as digital-first mindset, innovation, and customer centricity. Based on the results, we directly address the areas for improvement within our holistic culture framework: Vision & strategy, leadership & people, processes & organizational structure. Only be changing the framework conditions, corporate culture can be changed in an effective and sustainable way. Our proven and innovative accelerator methods such as our ASE and Digithon workshop formats ensure a sustainable and successful digital culture transformation. Our iterative approach helps shift the corporate culture in an effective and successful way towards a digital mindset. For further information, please read more about our agile New Change Deal.